Hunt Slonem, Chinensis, Oil on Canvas, 71.5 × 54.75 in. 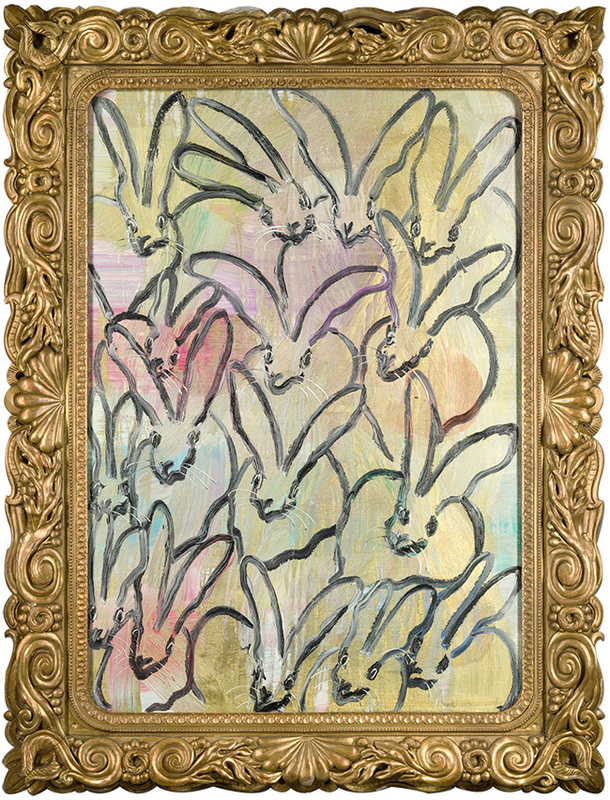 Hunt Slonem began painting bunnies when he discovered his birth year, 1951, is the Chinese Zodiac Year of the Rabbit. The internationally celebrated artist takes a deep interest in the symbolic and spiritual meaning behind each animal he paints. Best known for his whimsical bunnies, butterflies, and exotic birds, Slonem paints in a distinct neo-expressionist style. He chooses to use vibrant colors, crosshatch patterns and multiple layers. 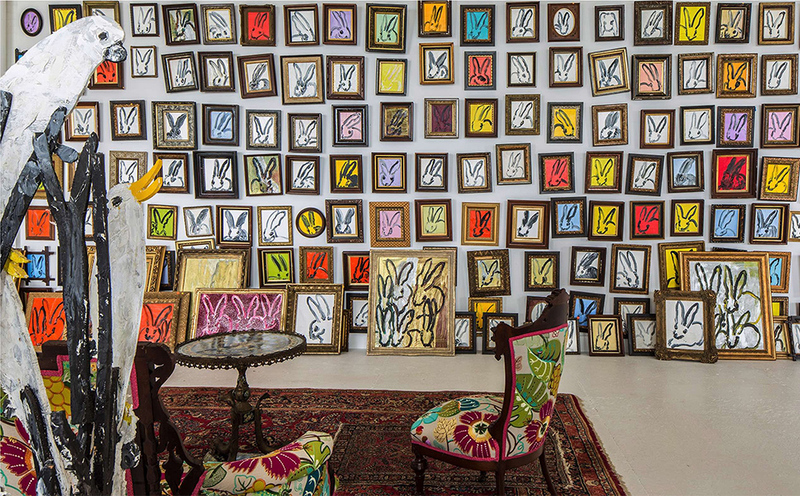 His pieces are often placed in salvaged antique frames that contrast with the simplicity of the paintings. Repetition is another important theme in the paintings. Many of Slonem’s pieces, like Chinensis, are partly influenced by Andy Warhol’s work. Unlike Warhol’s focus on advertising and mass production, Slonem’s repetition is meant to be meditative, similar to reciting a mantra. Because of his father’s position in the Navy, Slonem frequently moved around the country as a boy. He became inspired by tropical landscapes when his father was stationed in Hawaii, and again when he studied abroad in Nicaragua. “Exotica” has influenced his work ever since. Hunt Slonem graduated from Tulane University in the 1970s with a degree in painting and art history. Shortly after, he moved to New York, where he was introduced to prominent figures in the city’s art scene and started his career. Solo and group exhibitions all over the world have featured Slonem’s paintings. His work is in the permanent collections of 250 museums, including the Guggenheim, the Whitney, and the Metropolitan Museum of Art. Slonem’s portfolio also includes a number of public art commissions, as well as collaborations with designers to create fabrics and wallpapers from his art. The artist currently works from his eclectic studio in Brooklyn. 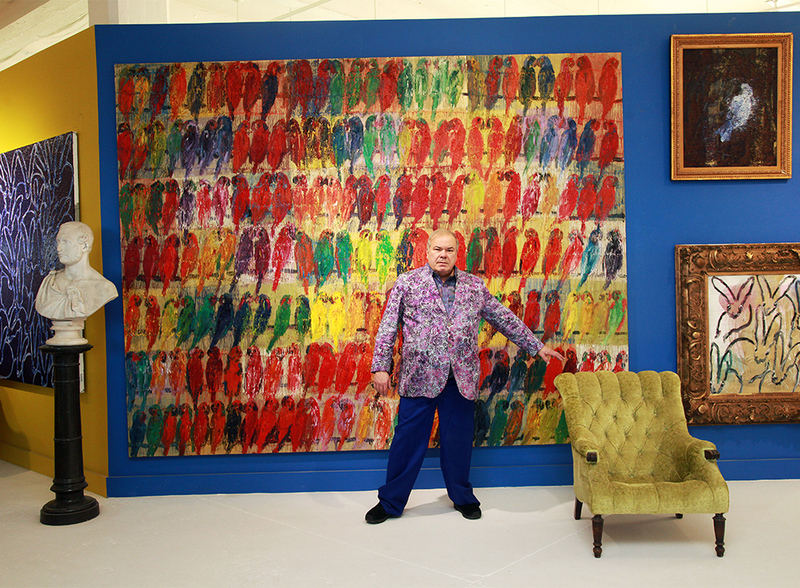 The 30,000-square-foot space is filled with brightly colored walls and antique furniture, along with the artist’s collections of top hats, harps and pet birds.